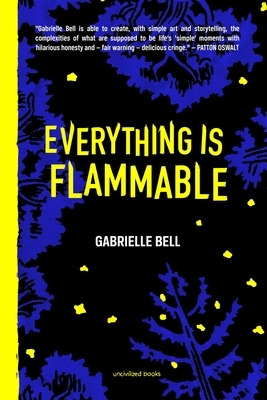 In Gabrielle Bell's much anticipated graphic memoir, she returns from New York to her childhood town in rural Northern California after her mother's home is destroyed by a fire. Acknowledging her issues with anxiety, financial hardships, memories of a semi-feral childhood, and a tenuous relationship with her mother, Bell helps her mother put together a new home on top of the ashes. A powerful, sometimes uncomfortable, examination of a mother-daughter relationship and one's connection to place and sense of self. Spanning a single year, Everything is Flammable unfolds with humor and brutal honesty. Bell's sharp, digressive style is inimitable. Gabrielle Bell's work has been selected for Best American Comics and the Yale Anthology of Graphic Fiction, and has been featured in McSweeney's, the Believer, Bookforum, and Vice among numerous other publications. Her story, "Cecil and Jordan In New York," was adapted into film by Michel Gondry. Bell's previous graphic novel, The Voyeurs, was named one of the best books of the year by Publishers Weekly, Kirkus Reviews, and the Atlantic. She currently lives in Brooklyn, NY.